Did you know there was such a thing as Hot and Spicy Food Day? Around my house, it seems, everyone who cooks, except for me, thinks it should be Hot and Spicy Food Day every day. But the actual "holiday" is August 19th. 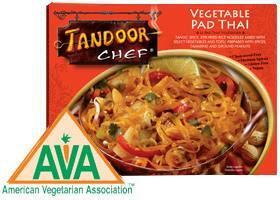 In honor of the day, we will be celebrating with a little Tandoor Chef - easy and quick. 1. Weight Loss: Studies show that the main compound in chilies, called capsaicin, has a thermogenic effect and may cause the body to burn more calories and boost metabolism. 2. Heart Health: Studies show that cultures that eat the spiciest foods have much lower incidence of heart attack and stroke. It could be because chili peppers help to reduce the damaging effects of bad cholesterol while capsaicin helps to fight inflammation. Heat up! Vegetable Pad Thai. 3. Cancer Prevention: Some studies suggest that capsaicin has the ability to kill some cancer and leukemic cells. Another spice, turmeric, may slow the spread of cancer and growth of tumors. Heat up! Balanced Vegetarian Palak Paneer. 4. Lower Blood Pressure: Vitamins A and C strengthen the heart muscle walls, and spicy heat can increase blood flow throughout your body. Heat up! Balanced Vegetarian Kofta Curry. 5. Boost Your Mood: Spicy foods boost production of feel-good hormones, such as serotonin, easing depression and stress. Tandoor Chef sponsored this post and may provide me with samples in return for my cooperation.